Two new laws — the Organic Law of the Ministry of Security and the National Police, and the Law of the Police Career — will enter into force on January 21, 2018 in Honduras, following nearly a year and a half of reforms within the National Police, and laying a clear legal groundwork for ongoing accountability and transformation within the institution. For civil society, the two laws are the result of over five years of advocacy. Previously, the National Police force was infiltrated by gang members, drug traffickers, and organized criminals, which generated fear and mistrust in the population, and caused the institution to struggle to fulfil its mandate to serve and protect. When national and international media revealed in April, 2016 that high-ranking police officials had participated in the assassination of Honduras’ anti-drug czar, the scandal galvanized the creation of a Special Commission for the Purging and Transformation of the National Police (CEDTPN). Since April of last year, this Commission has not only removed over 5,000 suspect officers from the police force, but, in parallel efforts, has also supported the creation of two laws that create efficient and accountable administration structures within the National Police and the Ministry of Security. The new Organic Law of the National Police not only regulates the National Police, but also the Ministry of Security. New, simplified structures of administration and management create greater accountability and increase logistical efficiency. In addition, this Law creates a Sub-Ministry of Police Affairs and new offices for Legal Services, Private Security Services, and Municipal Police. The new Office of Police Disciplinary Affairs replaces the Office for the Investigation and Evaluation of the Police Career (DIECP), which, despite a dual mandate to evaluate incoming officers and investigate officer misconduct, was not authorized to take disciplinary action. The DIDADPOL will focus exclusively on the investigation of misconduct by both police officers and employees of the Ministry of Security. It will emit technical opinions that oblige the Ministry of Security to oversee appropriate disciplinary action. The Organic Law of the National Police defines rigorous requirements for applicants to the Police Technical Institute (ITP), and creates a new center of formation within the Institute which will allow officers to develop a technical specialty during their training. The new Organic Law establishes a system of citizen oversight through the creation of a civil society commission that will continue to oversee and monitor the police force after the conclusion of the Special Commission’s mandate, contributing to ongoing compliance with modernization and transformation of the force. The law defines hiring requirements, including the application of “confidence tests” (including a background check, a toxicological test, and a polygraph test). Transparent, merit-based requirements for hiring and advancement, including a clear definition of compensation scales, will help prevent nepotism and patronage within the police force. The Law of the Police Career defines processes of ongoing periodic evaluation and recertification of police officers, including the development of a disciplinary process with sufficient powers to sanction or remove officers who are found to be unqualified or compromised. 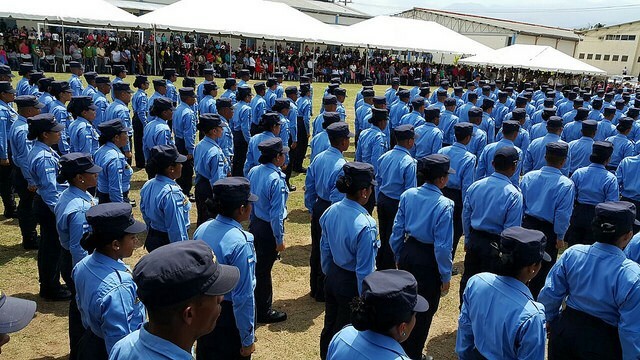 Both new laws formally commit to a community-focused philosophy and a commitment to the protection of and respect for human rights by employees of the Ministry of Security and the National Police.